from me to me :-) As you can see I have been finding out what it does, my practice piece shows the different stitches and sizes. I've also been trying to sew pieces on to the fabric, not sure what you call it, blimey, that's not as easy as it looks, going round corners is difficult. I definately need more practice. I was worried that the machine might go too fast and run away with me, but I have rectified that by using a naked right foot on the pedal. It will take me a while to get used to it, it's nothing like the old fashioned treadle machine I used as a teenager, but it will be interesting to try out all the functions. Don't hold your breath for some masterpiece to appear just yet, while the sun's shining I will be outside, the sewing will fit in nicely on rainy days. I used my bus pass again today, to go to Hull. 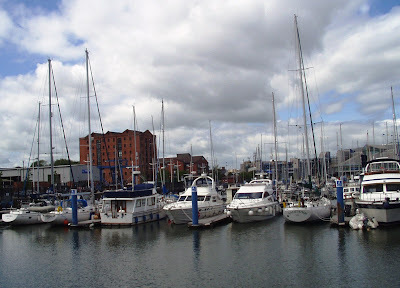 It's real name is Kingston upon Hull, so much nicer than just Hull. The bus station is massive, and so organised, buses coming and going every few seconds, it's a hive of activity. I went into the ticket and information office and gathered all the timetables which I thought might be usefull for my research on days out. Then I went walkabout, armed with my map and tourist guide book. As it is school half term there was a lot going on, continental food market, craft fair, childrens entertainment, and street performers. I took a few photo's. The Deep, one of the deepest and most spectacular aquariums in the world. I didn't go inside, maybe next time when I get a free ticket with my Tesco vouchers. 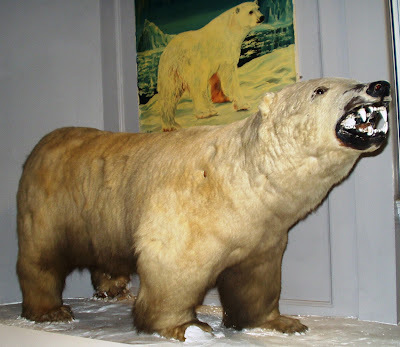 A polar bear in the Mariners Museum. Another frugal day out, I took my sandwiches and a drink, and didn't spend any money apart from £4.36 at Tesco. Well I had to get my reduced price bargains, didn't I, as the store was next to the Bus Station. 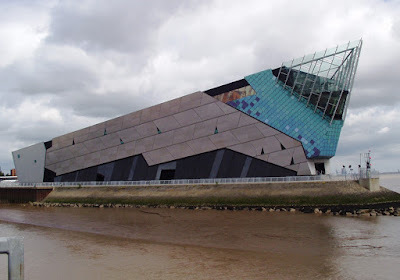 I will have to go back to Hull again, there is such a lot more to see. I love the interesting architecture, there are some lovely old buildings, and of course I must make sure I have enough time to go inside The Deep. 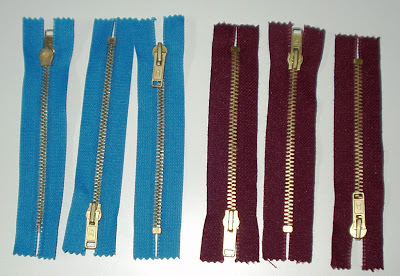 When I was at the Scrapstore a few days ago I picked up a few zips, they have got over a thousand of them, all five or six inches long and in various colours. 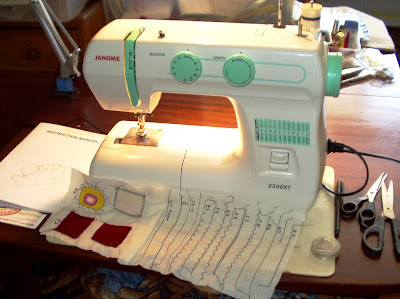 I spread them out on my dining room table, and pondered, usually you sew them onto fabric to open and close something. Thinking outside the box, why not sew them together. My first thought was a handbag, but as the zipper part is quite thick, the bag was going to be very heavy, what about a purse, it might just work. 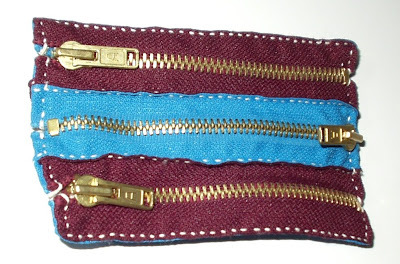 I picked out six zips in two colurs. Next, what to sew them together with? It will have to be strong because the purse will get a lot of rough handling and it will have to be robust enough to withstand a lot of pulling around. I have a reel of thin string, just the job. I decided to make the seams on the outside so the stitching shows up, and it will be easier to assemble. Here is the finished article, it measures 13cm x 9cm, and you can open it using any zip, quite a handy little purse. Cool eh! What pretty flowers I hear you say, yes they are, says I, and guess what, I found them. 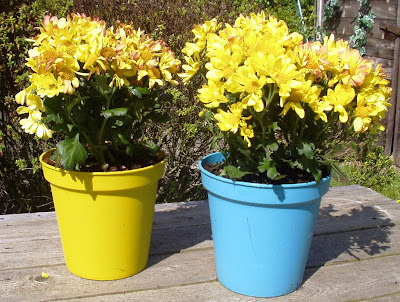 In our village we have got quite a few posh people who have money to throw away, I picked these two pot plants out of the church rubbish bin. I noticed the pots through the wire mesh sides and thought, oh good, free pots, you can never have enough pots. 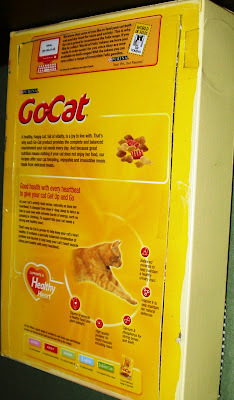 As I lifted them out I found they came with plants that are definately not past the sell by date. I repotted them and now they stand on display in my front garden, I wonder if anyone will recognise them, ha ha. Well they can't have them back, finders keepers. Another day in the garden, I love it, sun shining, what more could you want on a Bank Holiday. Certainly beats the rush to the seaside, only to find millions of other people all doing the same. 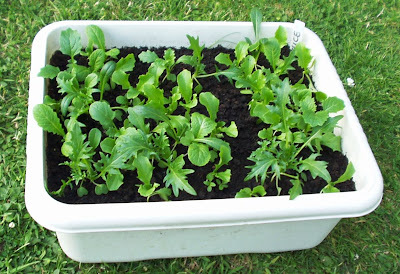 I thought I would put a few pics on here of my veg boxes, it's an ideal way to grow food if you haven't got much space, not that it applies to me, I have loads of space, but I just like the neatness of it all. 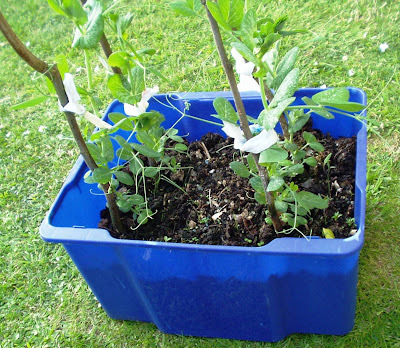 I use boxes for all sorts of plants that don't grow too big, I have tomatoes in them in my greenhouse, two plants to each box. Also two cucumber plants fit nicely. 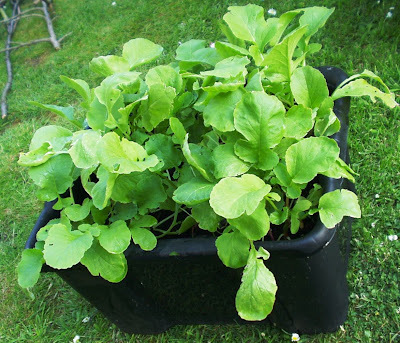 Last year I tried courgettes, one plant in each box. They grew alright and I had quite a few fruits off them, but they weren't as productive as those in the raised beds. 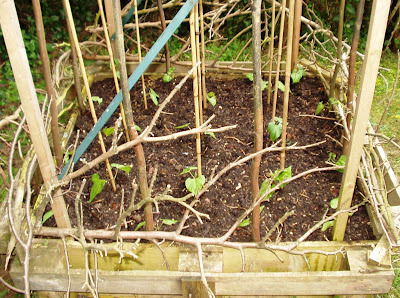 I ended up with six extra runner bean plants last year, so I put them in a box with their canes. They did fine, loads of beans from them. 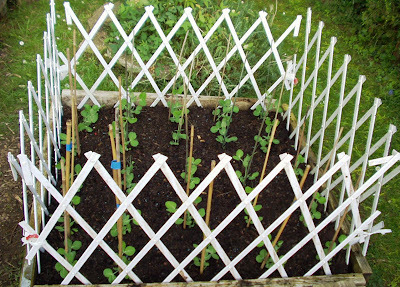 From the top down, Beetroot, Raddishes, Peas, Salad Leaves in a washing up bowl, Potatoes in an old kitchen wall cupboard, and peas in a bed with trellis round to keep the cats off. I've been doing a bit of washing up. I hate standing at the kitchen sink washing my pots and pans, but it isn't so bad when you can do the chore outside on the lawn on a sunny afternoon. I didn't even have to heat the water either because the sun had done that for me, I always have plastic buckets and bowls lying around to catch that sudden downpour. Here is part of my collection of drinks cups, yoghurt pots, plastic food cartons, and flower pots. 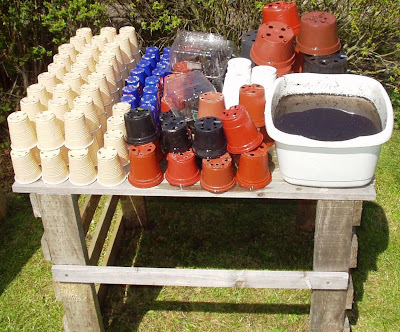 Most of my veg is in the raised beds now, only have to transplant the broccoli and cabbage, so I decided to get organised and wash up so the pots are ready for the next use. Next job is to tidy the garage/potting shed/wood store/general bits and bobs collection. Another trip out on my bus pass, this could become a habit. 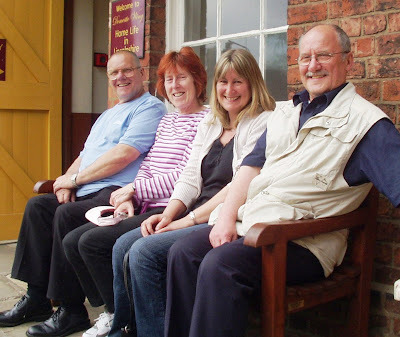 I arranged to meet up with some 'Down The Laners' from the Forum I am a moderator on, see right for link. Checking over the timetables, I picked out a bus that would get me into Lincoln at 10.30am. I wanted to do the whole journey on the bus but unfortunately the last bus back to my village leaves before the Lincoln bus gets in, so the only option was to drive the four miles to town. I met Wilma at the Bus Station in Lincoln, she came in on the Grimsby bus. It's a good job I told her to look for red hair, specs and shoulder bag, because I had accidentaly deleted her phone number when I cleared out my message box on the forum. 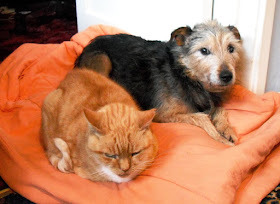 A senior moment, I think! 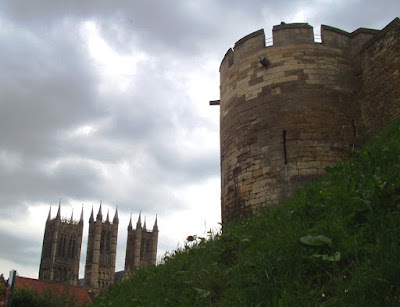 We had a good look round the museums and galleries, a walk up Steep Hill past the Castle and Cathedral. I love the little antique and gift shops, there was a mini craft fair in the street, me snooping for ideas again. 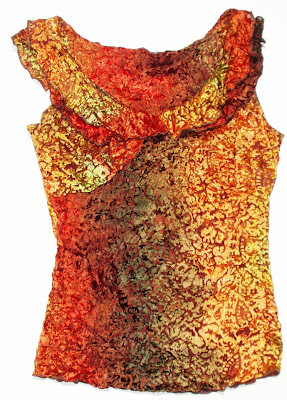 I had a chat with a woman who did felting, quite amazing how it is done, and she had some lovely bags, necklaces and bracelets. 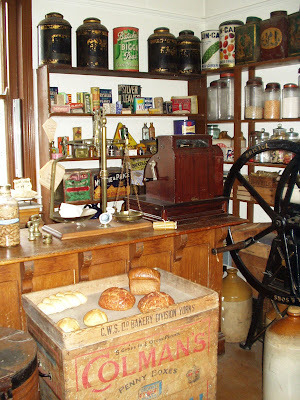 At 1pm we met two more Laners at the Museum of Lincolnshire Life, Silky and Mallard were waiting in the cafe for us. 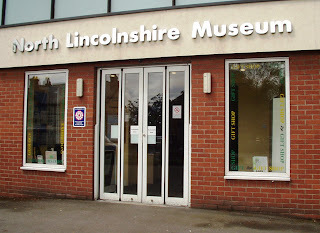 After chatting for an hour me and Wilma had a look round the museum, I took some pictures. 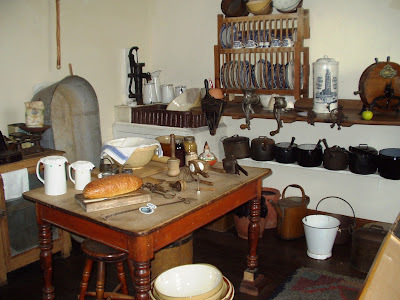 I love the old fashioned rooms in a house they set up, and the shops, can just imagine how they looked with people in them. Wilma got the 3.45pm bus back and I got the 4.15pm, All in all, a good day out, and it only cost the price of a drink, a toasted teacake, and an ice cream. Hope you like my pictures. Time seems to be flying by, when you are enjoying yourself, ha ha. Does it go faster as you get older? I went to the Scrapstore this morning to meet up with some like minded people who are passionate about recycling. There hasn't been much happening there for a while because of a lack of, 'can do', volunteers. Lorraine and Phil soldier on, but it's an uphill struggle when some committee members seem to exist in name only. I personally think it is almost impossible to get a good active committee working together in complete harmony. From my experiences there will always be one or two dedicated members, and the rest just make the right sounding noises. I'm not saying that's happening here, because I am the new girl, but it's my perception of all committees. I started the Lady Truckers Club and ran it single handed for seven years, I built it up to over 350 members, and that was before computers, a lot of hand written work was needed. Then they wanted a committe, so that's what they got. It worked for a while but just as I predicted it fizzled out, very difficult to keep it going on a national level. 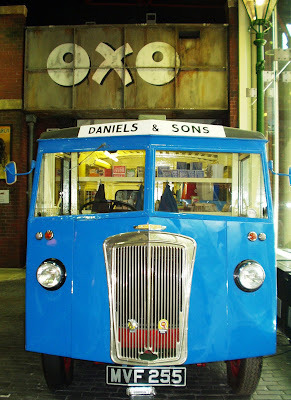 Still, it had served it's purpose, a support network for women in transport, I like to think I did my bit for the cause. 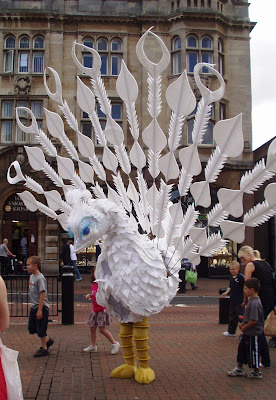 Anyway, back to the Scrapstore. It seems we have a little band of willing helpers which might work ok because we are all in the same area. We have a plan of action, we need more people through the door, and we need to collect more scrap. Our agenda has been recorded in our minutes book and hopefully things might happen. I came away with some scrap to play with, lots of zips, offcuts of vinyl and leather, coloured buttons, plastic bottles, and....metal hooks, don't ask, I am going to have to play with them for some inspiration. Oh dear, the sun's come out, I have some gardening to do, not enough hours in the day. 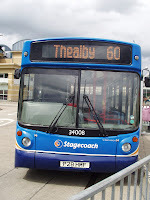 I've been for a test drive today with my new bus pass, just to see if it works, and it does, yipeeeee free bus rides. I got the 10.35 into town, the driver glanced at my plastic card and handed me a ticket. Now where shall I sit to get the best view out of the window? The seats towards the rear were higher so I chose third from the back, thinking the further back you go the bumpier the ride will be. 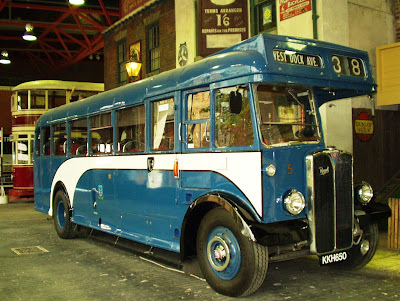 I remember riding on buses when I was a child, mums with buggy's had a terrible job of getting in and out of them. It's not like that now, the step is low so the buggy can be wheeled on, and plenty of room for baby to stay in the buggy. It was a bit hot so I opened a window, this will be a good way to keep warm when winter comes along, riding around all day on buses, ha ha. the exhibitions are very inspiring. The building is an old church with a modern extension to it, it works very well. You will see the Free Admission sign on the glass front. I can get lost in arty and crafty things, and I always want to sing when I am inside the churchy bit. Time to sit on a bench in the sun and eat my sandwiches, and watch the world go by. 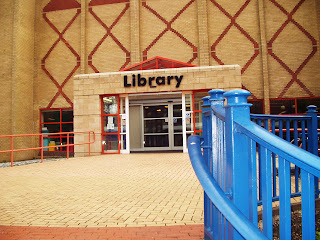 To finish off I went to my regular haunt, the library, and spent an hour reading the newspapers and magazines. I also picked up a lot of tourist leaflets and bus timetables, now where shall I go on my next jaunt? This is the only photograph I have of my birthday, I took my camera with me to the party but completely forgot about it because I was so busy doing my hostess bit. 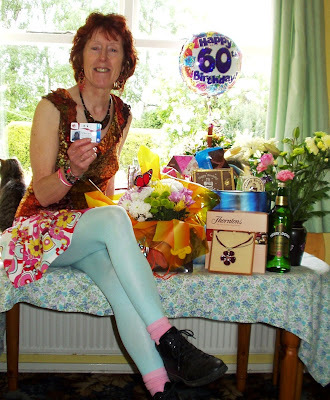 So this morning I put my party gear on and set my pressies out, yes I did get a few, some lovely flowers, choccies, necklace, bracelets, a couple of bottles, and Carol took the photo. I'm holding my bus pass :-) By the way, I had the most fabulous present from Carol, there's a big hamper in there packed with lots of lovely things to eat, bought from all the best shops. Carol often frequents Marks and Sparks for her food, in total contrast to my bargain hunting, so she had the good idea to get me some posh nosh. Now that's what I call a really usefull present. Sadly Carol is now on her way back to Hampshire, we have been friends for 50 years, although we don't see each other that often we know the other is always going to be there, surely the best kind of friend to have. Today is my birthday, not too much of a hangover from last night I'm glad to say, managed to curb my drinking a little, wouldn't want to spend my big day in bed. 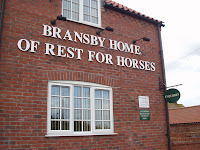 After a short dog walk with Ben so that I could show Carol around my village, we set off after lunch and arrived at Bransby Horses about 3pm. Carol, who lives in Hampshire, adopts a horse every year so I thought it would be a good opportunity for her to see the place. Unfortunately she couldn't visit her current horse because he has had an operation recently, he was kicked by another horse and had to have his jaw wired up. He is in quarantine because he has been away from the centre, this is to prevent any strangles being passed on. I handed over the money raised, which they were very pleased with then we went a walkabout to see the horses. On the way to Retford we stopped off at a lovely pub for a meal before our night at the theatre. I can highly recommend the Whitehouses Inn at London Road, Retford. I opted for a home made nut roast in a scrummy sauce with fresh spinach, broccoli, carrots, cauliflower and boiled potatoes, it was perfect. The show was a Rock-n-Roll music show, performed by Black Cat and the Blackettes. They performed songs from Connie Francis, Bill Haley, Jerry Lee Lewis, Chuck Berry, Buddy Holly, and Brenda Lee. I love that music, just can't stop my feet tapping. Pity I was stuck in the middle of the row or I would have got up and danced. Guess what, Carol had arranged for them to announce my birthday, so I had to stand up and reveal myself, in fact I was smiling and waving to everyone, I was so happy. It was a lovely day, I enjoyed my birthday treat. Up early today. Ben, my friends dog has been with me overnight, so a quick walk before I took him back home. Well, I say quick, I can't seem to do anything quick, I'm such a gas bag that I chat to all and sundry that cross my path. Next I am scooting around Tesco with my little shopping list for the last minute bread and salad for my party tonight, again gassing with everyone, I am so chirpy, getting in the party mood. As I turned the corner into my street, my best friend Carol is sitting outside the house in her car, having arrived five minutes before, good timing. Some catching up to do with the gossip, then we went round to the club to decorate the party room. Luckily I have been given all the banners and glittery bits by two friends who have also turned sixty in the last couple of months, when I have finished with it I shall pass it on to someone else. 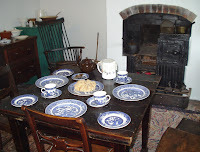 Room done, we were invited for a drink in the bar with Mad Mick, can't get plastered yet, we've got all the food to prepare. The next three hours were spent in my kitchen up to our eyeballs in bread, salad, nibbles, assembling it all into some kind of respectable buffet, with the help of a glass or two of Chardonnay. Of course I tried to make it as frugal as I could, margarine tubs came in handy for the reduced price crisps :-) We delivered the food to the club and then came home to change. Mandy the DJ was great, I had asked for all sixties music and that is what she played. Everyone was given a free raffle ticket and I donated some stock I had left over from a closed business, so that was a bit of fun. Tina Turner, aka Carol, put in an appearance later, the wig, black tights, what a scream she was, Simply the Best will never be the same again. I had asked for no presents, because I have everything I need, and I hate to see people waste money on stuff to fill my drawers. 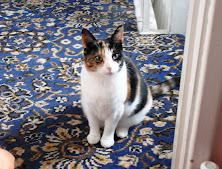 Instead I said if anyone wanted to make a donation, I would give it to an animal charity. 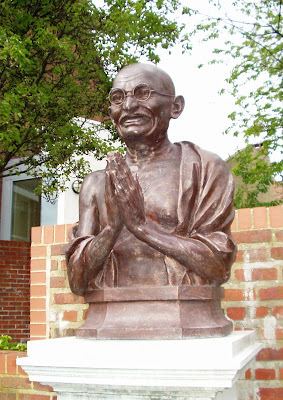 I chose Monkey World in Dorset, and Bransby Home for Horses near Lincoln. A quick count up at the end of the evening revealed £150, so £75 for each. It was a great party. 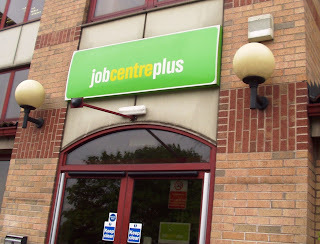 I'm such a happy bunny today, off I went this morning with a spring in my step and a smile on my face, to the........Job Centre, to sign on.... and to sign off. Yes, that was my very last visit, yipppeeeeee. No more queueing up and standing around waiting for my name to be called, no more asking me what I have been doing to find work, no more filling out my log sheet. The woman behind the desk asked me if I wanted to keep my little book, I said, no thanks, bin it. I said my goodbyes to a few nice people I had met in there, after all they are only doing their job. So goodbye Job Centre. The first thing I did next was to walk down the road to the office in the bus station to put my application in for my bus pass. There's no stopping me now, I'm looking forward to my free bus trips. Then I went to the library to pick up my tourist brochures on Yorkshire, there's a lot of places I want to see. Although I will be officially a retired person I shall still be keeping my eyes and ears open for some nice little part time jobs, not too many hours though. Maybe a little office based job in the winter to keep me warm, or a little driving job in the summer to get me out and about. 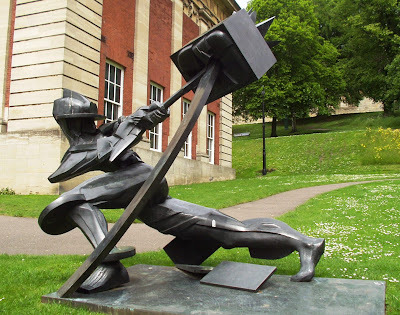 Only little jobs mind you, maybe a week here and a week there, don't want to overdo it, ha ha. Anyway, I've got a party coming up tomorrow night, so I'll be a bit busy with that, then a meal out and a theatre visit on Saturday night to celebrate my birthday, it's going to be a brill weekend. 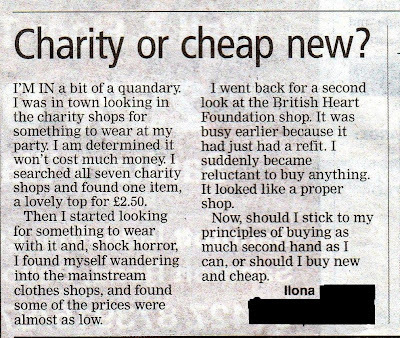 My letter did get printed in the local newspaper, see Thursday's post, but not in it's entirety, as you can see they edited out the bit about the cost of the shop refit. I might do a follow up in a few weeks time about losing the meaning of charity. I would hate to see any more charities going down this route, because it will kill off the whole idea. When people cotton on to where their donations are being spent, they will stop buying second hand. 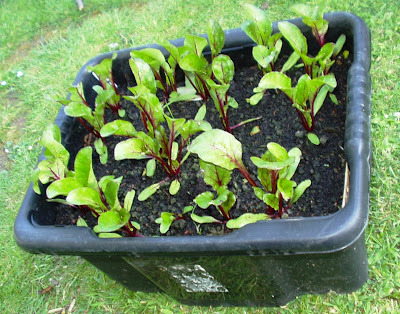 My veg garden is beginning to take shape now, things growing in pots are almost ready to be put into the raised beds. 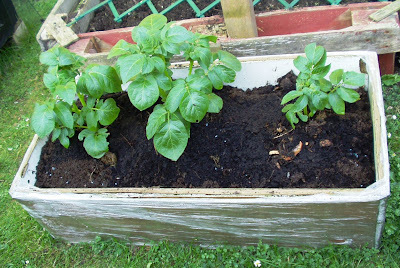 The spuds are coming up, I have two beds with nine in each, three in pots, and three in an old kitchen wall cupboard laid on it's back with the doors taken off, it's a bit like a mini raised bed. I put the bean poles up today in the corner bed and put 21 plants in, the twigs around the edges are to keep the cats out. 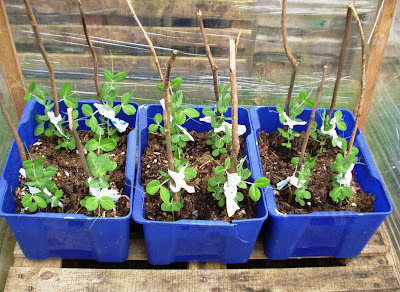 Here are some peas planted up in plastic storage boxes. 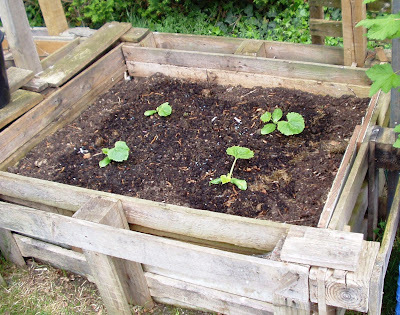 I have four courgettes in a bed, they look small at the moment but they will soon fill it. 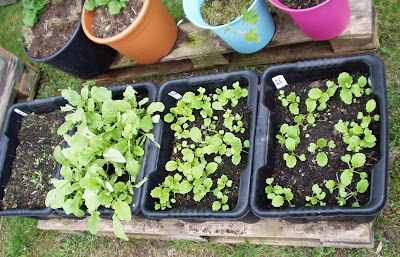 The radishes are coming along, and the turnips are starting to show. 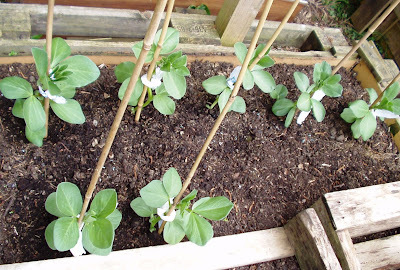 A few broad bean plants. Still lots more to do, I can see me being busy in the garden this summer. I did the 13 mile walk today, as I mentioned before, I knew the area as I have walked the footpaths many times. Twentytwo of us set off just after 10.30am. Lunch was a pub stop, I sat outside in the garden in the self catering section, bring your own sandwiches. I can't eat a big meal at lunch time, I would fall asleep. When I was ready to go some of them were still on their main course, so I decided to carry on alone. 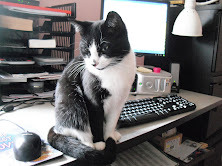 I won't bore you with all the details, my dinner will be ready in five minutes, I am looking forward to doing nothing this evening. 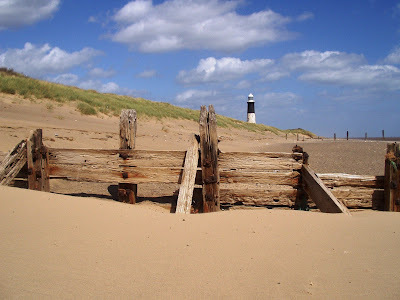 I have been thinking about visiting Spurn Point in East Yorkshire for ages, it looks so amazing the way this narrow strip of land jutts out into the North Sea. I've been reading up about it, apparently the peninsula is breached every 250 years, the sea cuts across it permanently and all beyond the breach is swept away and will reform again over the years, repositioning itself slightly to the west and pointing further south. Here is a link to an arial photograph. 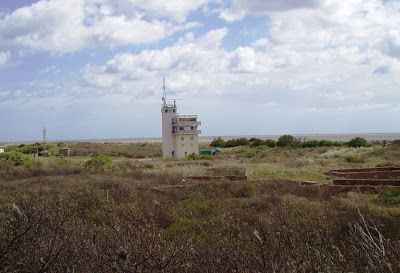 Spurn Point is 3.5 miles long and 50 yards wide in places, it has been owned by the Yorkshire Wildlife Trust since 1960, and the sea defences built by the Victorians are now crumbling. There is a life boat station which is the only one in the country with full time paid staff. There are seven men and their families who live in RNLI houses, 29 people in total, they work seven days a week and must be on call so can't go anywhere. The wives have to do all the running around, shopping, getting the car fixed, etc, and the children get the school bus every morning. The jetty also has the Humber pilots working from it, these boats guide the big ships in and out of the narrow and treacherous shipping lanes of the Humber. This is my photograph of the jetty. It's a nice day today so I set off at 10am, over the Humber Bridge, and through Hull. When I get my bus pass I'm going to have some days out here then I won't have to pay the bridge toll, it's £2.70 at the moment. I kept on going through a lot of villages, on the A1073 then the B1445. You can park for free before you go onto the peninsula, and walk the three and a half miles to the point, I decided to drive almost to the end, and pay the £3 parking, because I wanted make sure I had enough energy to do some exploring as well as some beach combing. 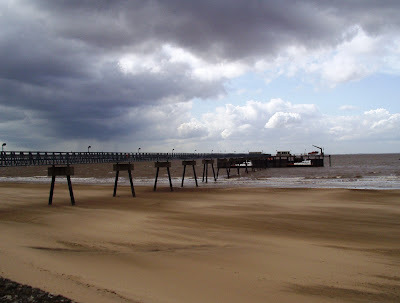 It was very windy as I walked towards the point, the tide was out so I went down onto the beach, it was like being in a sand storm, thank goodness my back was towards the wind or I would never have been able to open my eyes. 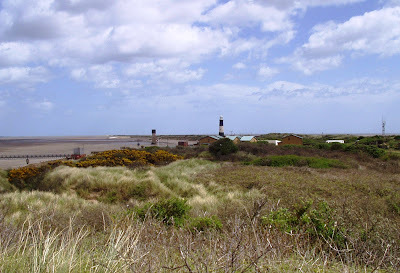 I walked along the North Sea side of it for a while then went up onto the sand dunes. 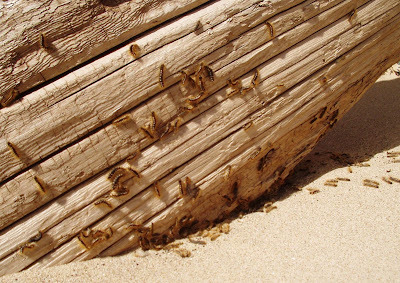 There was squillions of brown caterpillars everywhere. 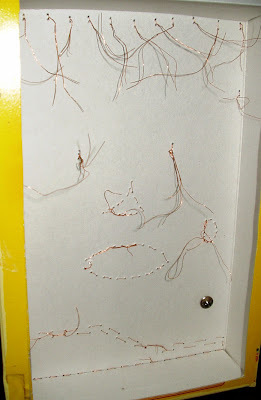 These are from the brown tail moth, a notice said not to touch them because their small barbed hairs may cause irritation, often developing into a rash. 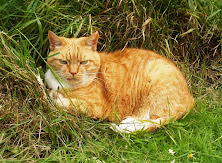 I decided to sit down in a sheltered spot to eat my lunch but wasn't there very long, I jumped up when I noticed some furry little bodies climbing over my boots and scurrying up my trouser legs, thankfully on the outside. 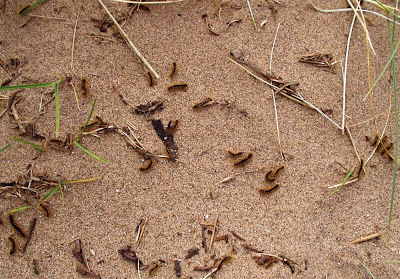 The caterpillars were everywhere, in the grasses, blowing across the beach, getting squashed on the road. 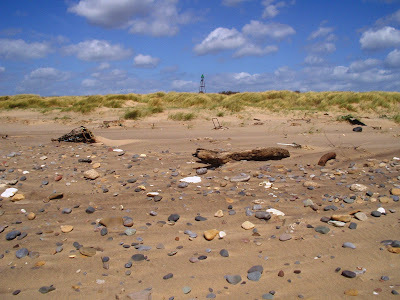 Another reason I wanted to visit Spurn is that we have an exhibition at the Arts Centre in Scunthorpe at the moment, of thousands of pieces of plastic picked up from the beaches, by artist Martin Waters. If you look at his web site there are pictures of it on the Installations page, the six big coloured panels, they are pretty impressive. 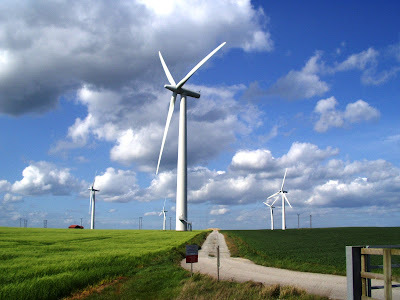 On the way home I went a slightly different route, to drive past the wind farm at Holmpton, the seven turbines were spinning in the wind. I stopped off at Withernsea and had a lovely fish and chip tea. 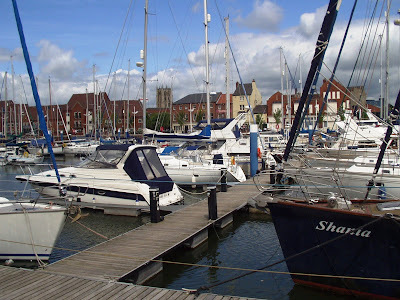 This is a small seaside town with a few amusement arcades, I took a walk down the promenade before I left to come home. I really enjoyed my day out. Then I started looking for something to wear with it and shock horror ! I started looking in the mainstream clothes shops, and I found some of the prices were almost as low as the charity shops. Now this may be that the charity shops are putting their prices up. At one time you could guarantee that their prices were rock bottom, but now you have to search the sale rails for any bargains. I went back for a second look at the British Heart Foundation shop, they were busy earlier because they have just had a refit and everyone was crowding in to see their brand spanking new shop. Just as I was browsing the rails it struck me that they have spent a lot of money, everything looked perfect, even down to all the coathangers being the same good quality wooden ones. The press arrived from the local paper, and I stood earwigging as they interviewed a very smartly dressed young chappie, obviously from the regional or even national headquarters, you never see someone like him helping out on a day to day basis. Of course he was singing the praises of his shop. 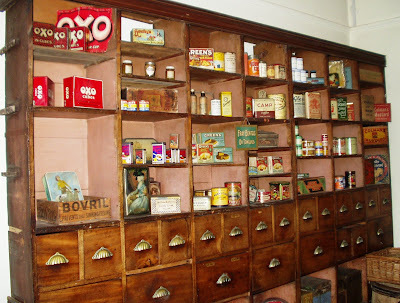 I suddenly became reluctant to buy anything, for a start it looked like a proper shop, the prices were slightly higher than you would expect, probably to pay for the refit, and it lacked the homely, friendly, thrown together feeling. It's far too posh for me. Now my quandry, should I stick to my principles of buying as much second hand as I can, or should I say sod it, I might as well buy new and cheap if the charity shops are going to spend all my money on expensive refits? Don't know what to do now! 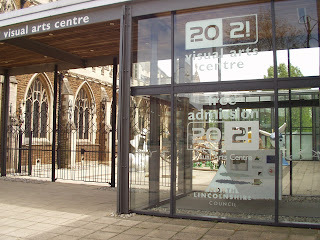 I've had a lovely day out today, courtesy of North Lindsey College, another free course. So far this year I have done Introduction to Psychology - ten weeks, Introduction to Social Sciences - ten weeks, Running an Event - one day, and today was Introduction to Life Coaching. I am also part way through another ten week course, this time Health Psychology. None of these have exams or qualifications, they are taster courses that people can attend if they are not sure whether they want to sign up for the real course or not. If I was about twenty years younger I might seriously consider going down the Life Coach route, but for now the subject will remain just an interest. I love learning about life, I think I have mine pretty much sorted so I am lucky. Others are not so lucky. When I was young I didn't think I was worth very much, I had very little confidence, but things changed when I realised that I had choices, at the first opportunity I left home to stand on my own two feet. I could live where I wanted to live, I could do the job I wanted to do, I loved my freedom and independance. I have just re-read the above, I said I am lucky, let me re-phrase that. I am lucky because I thought about my life, about how I wanted it to be, and about which direction I wanted to go. I thought about the decisions I needed to make, and the changes I could make if I was not happy about something. So maybe I shouldn't say I am lucky, because it was all planned. There is one quote that keeps coming back to me, and I don't know who said it, 'If you don't have a plan for the rest of your life, someone else does.' How true. When I started it I didn't know how it was going to finish up, I had no idea it was going to be a face. 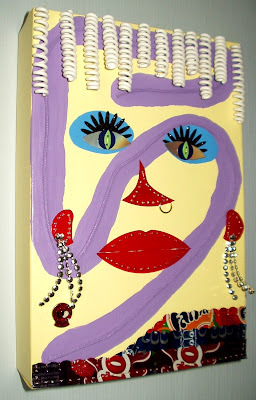 I stuck the cord on first with lilac paint. The ears, nose, and mouth is cut from a cd and painted with nail varnish. I boiled the cd for a few minutes to see what would happen to it, the two layers fell apart which made it thin enough to cut with scissors. There is a real earring through the nose. Drinks cans cut with curly scissors, mix the colours. The eyes are blue vinyl, unpainted cd bits, plastics cut from shampoo bottles, and the eyelashes are cut from a decoration you stick on a gift. The hair is the curly electrical wire, and earrings are christmas decorations. On the bottom left hand corner I have put my blood donors badge. I think I might make some more of these and make a collection of faces, all different.